Not always is the time that you would be running to engadget or gizmodo to search for a gadget that you feel is really cool, and you might need more info about it. The site being talked about here is Gadget advisor. Where you get full free information about the best of the best gadgets, and not all the gadgets that are there in the technological world. The owner says that the items written about, in there, are hand-picked and the best ones which people would love to have, and read about. There is no use of listing each and every tech product if no one is interested in reading about that. Gadgets are in various categories and types, like some related to media like iPods, mp3 & mp4 players, TV sets, home theaters, communication gadgets like Mobile phones, Internet tablets, others for geeks like Laptops etc. So there are endless products. Would you really be getting enough time to read about everything? So, just glancing through only the best products would be a great option, and that’s what Gadgetadvisor does. Just displays the best. Not every gadget blog writes reviews of products such as Logitech Harmony Advanced Universal Remote Control and a network media player, rather you would see the standard mobile phone and laptop reviews, some laptop review sites are good though. There is something apart from the gadgets too, like the online backup services are reviewed and selected to share the best ones. One thing i liked about the site is its simplicity and the ease of navigation. Might be i can be mistaken as the site is still new. Most of the information is available on the homepage itself, so no need searching a lot for anything, you would get every info easily. It is a site where you would love to stay to learn about the best gadgets, and subscribe to, for any updates. That sounds very interesting! I have to admit I dont have funds for all the cool and chic newly released gadget but I do love reading stuffs about them.. Lemme check it then. Thats a good site, and very nice design. 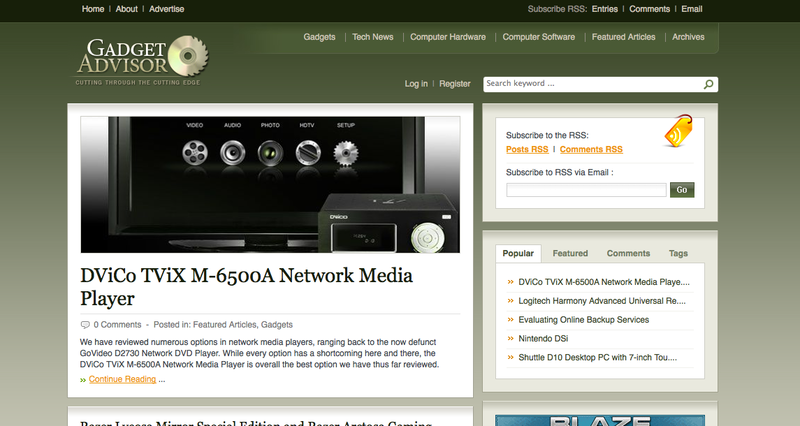 I liked it overall, and as i am fond of gadgets, i am subscribing to that blog. I love it! It’s a good one! and i love it’s design! it’s so interesting an absolutely fantastic! Wow that is fab.. I am always excited to read about new things and gadgets..
It’s so nice to see that everyone likes it as i do! it is really is! I don’t know this site until you mention. @Amar its good we get to know chetan site. I used to visit amitbhawani.com everyday and from there only i came to know about this blog and i am so glad that i came to know about this blog..